با توجه به اهمیت و نقش تجارت خارجی در توسعه اقتصادی کشور و نیز تأکیدی که برنامه‌ریزان اقتصادی کشور به گسترش صادرات غیرنفتی دارند و همچنین جهت رهایی از اقتصاد تک‌محصولی، لزوم توجه بیشتر به اقتصاد تک‌محصولی ضروری می‌باشد. از میان محصولات صادراتی برخوردار از مزیت نسبی زعفران به دلیل موقعیت ویژه آن از لحاظ اشتغال‌زایی در بخش کشاورزی و ایجاد درآمد ارزی قابل‌توجه برای کشور یک محصول مهم در اقتصاد تلقی می‌شود. اهمیت زعفران به‌عنوان یک محصول صادراتی باارزش در اقتصاد کشور و همچنین اقتصاد جهانی، روز به روز آشکارتر می‌گردد. برای حفظ مقام ایران) به‌عنوان بزرگ‌ترین تولیدکننده و صادرکننده زعفران (در بازارهای جهانی و توسعه بیشتر صادرات این محصول باارزش، شناخت مسائل و مشکلات صادرات و عوامل مؤثر بر آن، می‌تواند گام مهمی در این راستا باشد. ازاین‌رو، مطالعه حاضر به دنبال بررسی عوامل مؤثر بر تجارت زعفران ایران طی دوره زمانی 92-1380 می‌باشد، بدین منظور از مدل جاذبه و روش اقتصادسنجی پانل استفاده شد و نتایج نشان داد که تولید ناخالص داخلی و جمعیت کشورهای وارد‌کننده و نرخ ارز به‌ترتیب با ضرایب 55/1، 015/0 و 54/0 تأثیر مثبت و معنی‌داری بر تجارت زعفران ایران دارد. Considering the role of the foreign commerce in economic development of the country and the emphasis of economy planners to develop non-oil exports, and also to get released from the single-product economy, it is necessary to pay more attention to one product economy. Among the export products with substantial privilege, saffron is considered as an important product in the economy. This is because of its special position in the occupation of farmers in the agriculture sector and having a considerable exchange income for the country. The importance of saffron as a valuable export product in the country’s economy and also in world economy becomes more obvious now. To keep Iran’s position as the greatest producer and exporter of saffron in world markets and increase the export of this valuable product, a study of the problems of export and its effective factors could be an important step in this case. 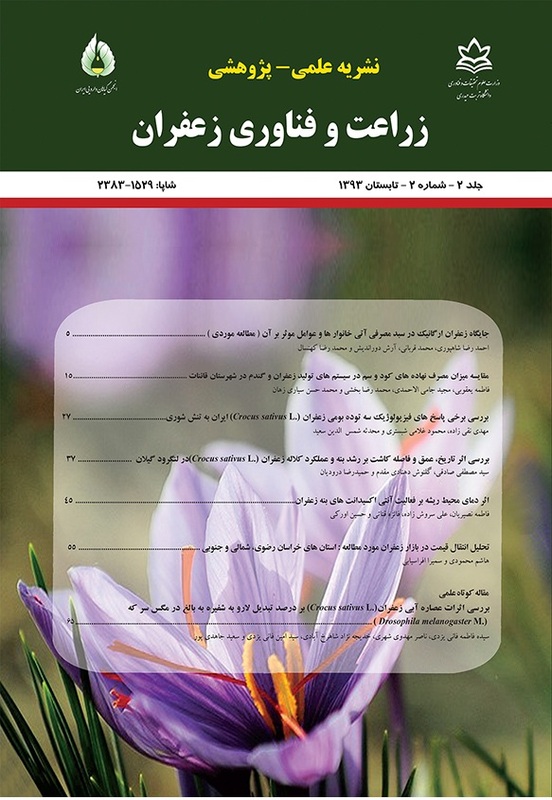 Therefore, this research studied the effective factors on saffron commerce in Iran during the period of 2001-2013. In this study, the gravity model and the method of economy measuring panel is used. The result showed that the gross internal production and the population of importing countries and exchange rate with coefficients: 1.55, 0.015, and 0.54 have positive and considerable effect on Iranian saffron. Barghandan, A., Barghandan, K., Golestaneh, S., and Mirlashari, H. 2011. Investigating the effect of real effective exchange rate on the Iranian Pistachio export. International Journal of Nuts and Related Sciences 12 (42): 990-997. (In Persian with English Summary). Biriya, S., and Jabalameli, F. 2006. Factors affecting the export of pistachio, saffron, date, the basket of goods exports (1991-2001). Journal of Agricultural Economics and Development 15 (54): 86-101. (In Persian with English Summary). Daneshvar, M., Karbasi, V., and Sarvari, A. 2005. Globalization and its effects on exports of saffron. Articles Collections Second National Conference of Saffron. Mashhad, Iran. (In Persian with English Summary). Farzinvash, A., and Biriya, S. 2011. Analysis of the impact on demand of the hybrid system and the combined reserves of developing countries. Journal of Economic Studies 10 (2): 1-27. (In Persian with English Summary). Ferto, I., and Fogarasi, F. 2012. On trade impact of exchange rate volatility and institutional quality: the case of central European countries. Paper prepared for presentation at the EAAE 2011 Congress. Karbasi, A., and Ahmadi, H. 2012. Effects of exchange rate fluctuations on the volume and price of exports raisins. Journal of Danesh and Toseh 17(32): 137-163. (In Persian with English Summary). Kashi, K., and Lynn Kennedyp, P. 2012. Exchange rate volatility and bilateral agricultural trade flows: the case of the United States and OECD countries. Prepared for presentation at the Southern Agricultural Economics Association Annual Meeting, Birmingham, February 2012. Kerami, A., and Zibaee, M. 2008. The effects of exchange rate volatility on exports of agricultural products in different countries. Journal of Economic Research 8 (3): 59-71. (In Persian with English Summary). Khalilian, S., and Farhadi, A. 2003. Factors affecting exports of agriculture in Iran. Journal of Agricultural Economics and Development 5 (39): 71-84. (In Persian with English Summary). Khalighi Sikaroodi, L., and Shokat Fadaie, M. 2012. Effect of foreign currency exchange rate policy on export Iranian Dates. Journal of Agricultural Economics 4 (4): 97-112. (In Persian with English Summary). Koochakzadeh, A., and Koochekzadeh, S. 2013. Effect of exchange rate uncertainty on exports saffron; Application Auto Regressive Distributed Lag. National Conference on the latest scientific achievements of saffron. Iran. 30 October 2013. (In Persian with English Summary). Nikbakht, Z., and Nikbakht, L. 2012. Economic convergence analysis (two-way FDI) in the states of D-8. Economic Research Rahe Andishe Journal 1 (1): 141-161. (In Persian with English Summary). Mortazavi, A., Darbandi, E., Alaie Brojeni, P., and Rafiee, H. 2011. Investigate the relationship between exchange rate and export of dates. Journal of Economics and Development Agriculture 25 (2): 246-252. (In Persian with English Summary). Pasban, F. 2007. Study of Effective Factors on the export of saffron. Economic Research Journal 6 (12): 1-15. (In Persian with English Summary). Rezapoor, S., and Mortazavi, S-A. 2011. Effects of globalization on supply and demand export saffron. Journal of Economics and Agricultural 4 (3): 153-169. (In Persian with English Summary). Sadeghi, S-K., and Khodaverdizadeh, S., and Khodaverdizadeh, M. 2012. Determine the comparative advantage and export market structure of global imports and exports of saffron. Journal of Agricultural Economics 3 (3): 28-34. (In Persian with English Summary). Sandu, C., and Ghiba, N. 2011. The Relationship between exchange and export in Romania using a vector autoregressive model. Journal of Time Series economic 13 (2): 476-482. Shakibaee, A., Bata, F., and Hydarabadi, S. 2012. Analysis of integration between Iran and Turkey. Journal of Economy and Regional Development 1 (3): 78-98. (In Persian with English Summary). Tajiani, H., and Koopahi, H. 2005. Timates of demand and supply for export of Iranian saffron. Journal of Agricultural Sciences 34 (4): 573-580. (In Persian with English Summary).